MRE Meals – Meals, Ready To Eat – Be Prepared! 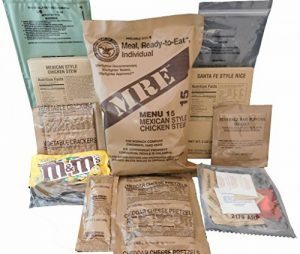 If you have never given any thought about MRE meals, which by the way stands for Meals Ready to eat, maybe it’s time that you at least take some time to investigate what they are, how do you get them, how do you store them, how long they might last in your home and what you might have to use them for. If you are now going “pfffttttt” and thinking why in the heck would I ever want to buy MRE meals, much less eat them, let me give you a reason why. Just like the Boy Scout motto, it’s called “Be Prepared!” Because let’s face a little bit of reality here, you never know when “the s**t might hit the fan” or what is commonly know by the abbreviation of SHTF. In other words, natural disasters. And if you think that’s way off base and not relevant to you and to where you live, well, maybe you’re right, but I want you to consider a few things first. Again, it never hurts to be prepared! And part of being prepared for an emergency, any emergency, is having food that you and your family can safely eat until your surroundings get back to normal. So maybe having a supply of MRE meals on hand in your pantry, along with other items like water, certainly can’t be a bad idea, right? And you never know, they might just come in handy one day. Look, the purpose here isn’t to focus on doom and gloom scenarios, far from it. The purpose here is to hopefully spur some thoughts so that you can take a look at how well you might be prepared to face a local disaster should it occur. The second purpose here is to give you enough information regarding MRE meals so that you can make an intelligent decision on whether or not they will work for you. If they do seem a logical choice to have as a stand by food supply for you and your family, great, this page has done it’s job. If not, and you’ve made it this far, maybe your eyes have been opened just a tiny bit. And if that’s the case, this page has also done it’s job. MRE Meals – Menu Please? First of all, let’s dispel any myths that MRE meals, meals ready to eat, are akin to opening up a can of unappetizing mush and eating something that maybe your cat would turn its nose up to. In fact, this is the farthest thing from the truth! As most of you already know, MRE meals are the bread and butter (sorry for the pun) of our military fighting forces and a lot of painstaking research and development goes into making meals that a soldier actually wants to eat. In fact, feeding for our troops is taken very seriously by the Department Of Defense. Everything is constantly being tested, researched and improved upon. And all that happens at the military’s Combat Feeding Directorate which is part of The Soldier Research, Development and Engineering Center based in Natick, Massaschusetts. Since the debut of the MRE meals back in the early 1970’s, menus have changed and evolved on a continual basis. So what does this mean for you right? What it means to you is that if you choose to use MRE meals as part of your emergency preparedness, you can feel comfortable in knowing that the food you will have to eat will not only be convenient, but you’ll also be able to store a wide variety. After all, I highly doubt you’ll want to be eating the same thing for every meal, right? And that’s just a sampling! Kind of beats the heck out of a peanut butter and jelly sandwich on white bread don’t you think? Now do you see why MRE meals are becoming so popular among those who want an emergency food supply on hand? Again, maybe they are right are for you, and maybe not, but you should at least consider MRE meals as a way of feeding yourself and your family should disaster strike. Be Prepared and click here if you want to read The Lost Ways review by Claude Davis. Alec Deacon & Charles Green Blackout USA Reviews – Can You Survive Darkest Days during EMP attack? Do You Need A Survival Kit?